Serial bomb attacks in six Iraqi provinces, including 10 locations in Baghdad, has killed 62 people and wounded dozens more, Iraqi police say. Many of the dead in the Iraqi capital were Shia pilgrims gathering for a religious festival. 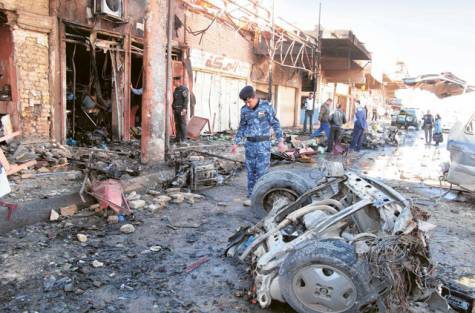 In Hilla, two car bombs exploded near a restaurant, killing at least 15 people. There has been a wave of attacks on the Shia community in recent days, as it marks the anniversary of the death of Shia imam Moussa al-Kadhim. Four people were killed in a mortar attack near a religious shrine in Baghdad on Sunday. Iraq’s interior ministry said following that attack that there would be heightened security across the city as they anticipated further violence. Pictures from Hilla on Wednesday showed the mangled remains of a restaurant, damaged cars and roads strewn with debris. Police and fire crews were clearing the scene. Violence in Iraq has fallen since the sectarian killings of a few years ago, but militants still frequently attack security forces and civilians. Shia targets have come under renewed attack since the government of Shia Prime Minister Nouri Maliki moved against senior members of the predominantly Sunni Iraqiya political bloc.